Candied flowers make elegant cupcake decorations. Candied flowers: They taste like crispy marshmallows, you can make them at home, AND they look like flowers (because they are). But why bother? My top reasons may surprise you. Coolest drink garnish ever. Candied flowers on the edge of an iced tea? Candied mint leaves for a mojito? Yes and yes. Candied flowers make cheap ice cream taste better. Believe. So that steak didn't turn out so great? At least now you can make it pretty with a few crystallized flowers. Then order takeout, and call it a night. Top reason for most delicious home food experiments. For the brave home food decorators out there, I provide detailed instructions and more pictures below. The instructions might look daunting, but the whole process is pretty easy: choose an edible flower, coat lightly with egg white, sprinkle with sugar, let dry. They keep for weeks. My experience? Well, I started out using pansies, but the petals were too big and thin to support the weight of sugar. Mini pansies? Bingo. I had a much easier time. Still, I went through quite a few flowers before I had six that looked really good. Practice, practice, practice. I was overzealous with the sugar the first few times; Those flowers ended up looking like sugar cubes. If you're looking for edible cake decorations, consider sugar flowers for cakes, cupcakes, and other desserts. Want to learn how to make candy flowers yourself? Pasturized egg whites (Buying commercially pasteurized egg whites takes the guesswork out of egg safety. You won't need more than 1/4 cup of whites for 1 cup of flowers). Superfine sugar (At least half a cup should be enough for 1 cup of flowers). You can use regular granulated sugar, but it doesn't look as nice. Patience. Some of these candied flowers aren't going to look pretty. Sage advice: Eat them and move on. Edible flowers can easily be preserved as candy flowers and used to decorate cupcakes and other desserts. 1) You'll need to begin by selecting edible flowers. Lists are widely available online. Be aware, though, that some people with severe pollen allergies still can't eat flowers that are otherwise considered edible. You will also want to make sure that the flowers you've selected have not been sprayed with pesticides, fungicides, or plant food. To meet this constraint after deciding to make candied pansies, I bought several containers of pansies from a local nursery. I then snipped off all of the existing blossoms and buds. I waited about a week for the new, unsprayed, flowers to bud and bloom, and used those to make candied flowers. 2) Brush the top and bottom of each flower petal with a thin layer of egg white. Don't dunk the flowers - the whites either won't stick to some areas without the attention of a brush (and those un-covered parts will wilt), or you'll end up with too much egg and the flower won't get crispy. 3) Pour some of the superfine sugar on a small plate. Hold the flower above the plate and gently sprinkle the flower with sugar. Flip over, and sprinkle sugar on the other side. 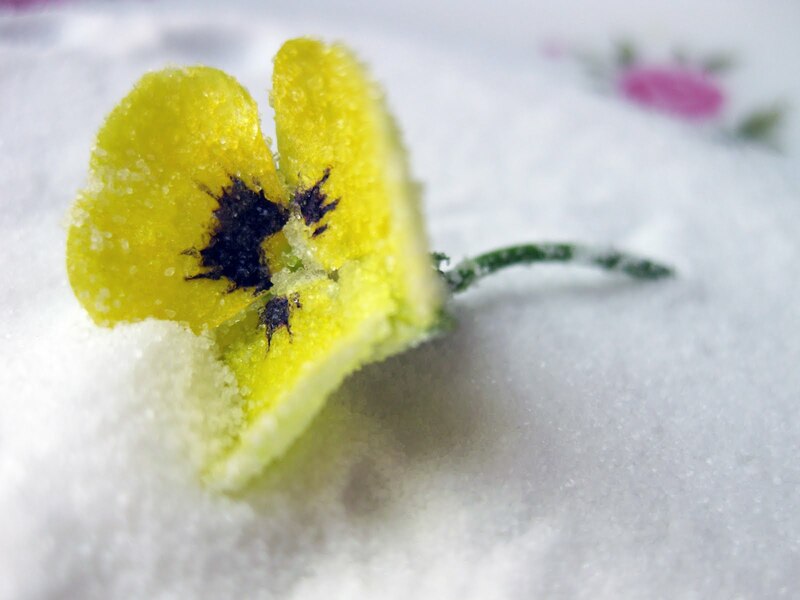 If you continue to add too much sugar, the flower will become completely matted in thick sugar, and it will begin to look more like a sugar cube than a flower. 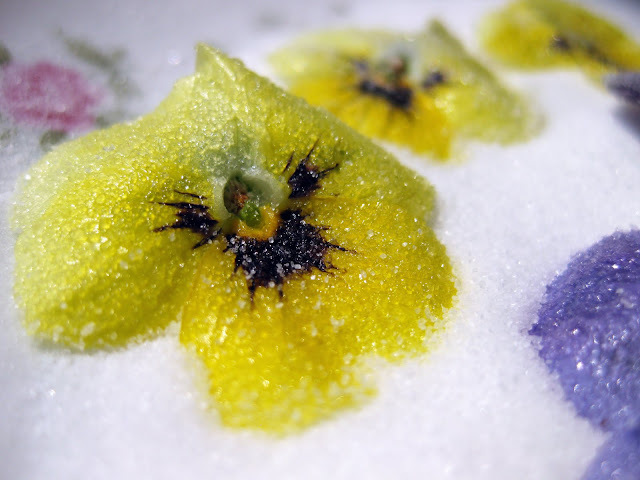 Pansies are among the many edible flowers that can be candied. 4) Set the sugared flowers on the parchment paper so they aren't touching. Allow to air dry 1 to 3 days, or until crispy. If you're in a race against time, you can preheat the oven to the lowest possible temperature while you're working. When all your candied flowers are on the baking sheet, turn off the oven and let them dry in the oven for 6 hours or until crispy. 5) Store your creations an airtight container. 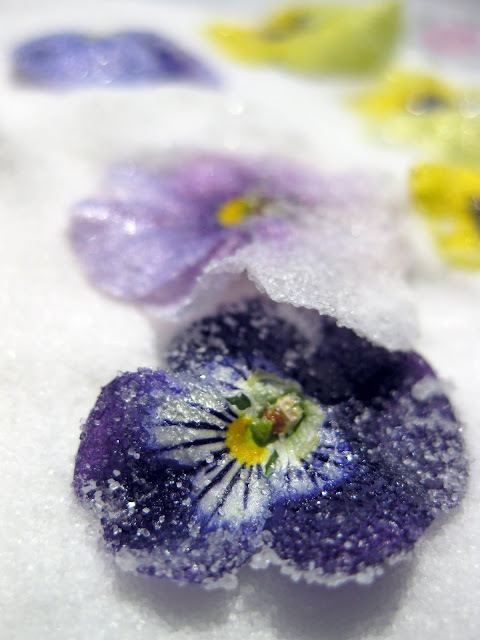 Crystallized flowers should keep for at least several weeks and up to several months. 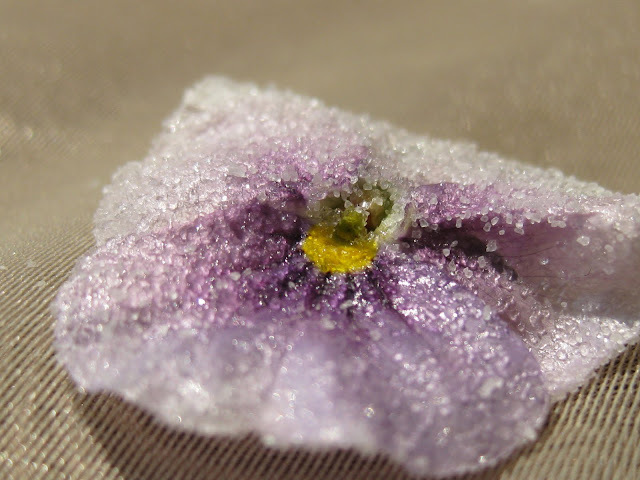 I've been wondering whether you could make salted flowers using salt instead of sugar. Would that work, and would it be too gross to try? What would you eat them on? Thanks. Best tutorial I've seen yet. Thanks for mentioning your mistakes because that saves me from doing the same thing. Awesome. I was worried candied flowers would be a little too great-grandmaish, but you have shown me it's quite hip and mod. Using for shower mini cupcake toppers. Thanks so much! Thanks, Abbie! I'm so glad you found this post helpful!